This article was GGWash’s 7th most popular post in 2018. If you like what you read, please support our journalism by joining the GGWash Neighborhood, our membership program. You contribution keeps our blog going, and also connect you to our community of readers. Join today! For decades, school planners assumed that families would move out to the suburbs once they had kids, and made projections for where and how to build new schools based on that. But as that trend begins to shift, Montgomery County is finding school enrollment harder to predict, which creates new challenges in and out of the classroom. Like many places, Montgomery County Public Schools predicts how many students will enroll in local schools for the next several years, and if a school will have enough room or if it’ll be over capacity. Like many places, those projections, along with traffic predictions, can be used to stop new development. How did this happen? In a recent Washington Post story, reporter Katie Shaver notes that Montgomery County Public Schools didn’t anticipate changes in how and where families want to live. The school system is seeing a lot of growth in close-in areas like Silver Spring and Bethesda, because more families want to live in urban, walkable neighborhoods where they can walk to shops, jobs, or transit. These communities are also becoming very expensive because there’s a lot of demand to live there, and outside of a few areas, very few homes are being built there. As a result, many parents can’t afford to buy a house and are instead renting apartments, living with relatives, or even doubling up with other families to make ends meet. Turnover in older homes and new buildings both contribute to student growth in Silver Spring. Image by the author. All of those things are contributing to increased school enrollment, and the school system has to catch up. In most of Montgomery County, developers have to pay a fee for each new home they build to help pay for schools. But if an older, childless household with sells their home to a young family with kids, as is often the case, the county doesn’t get any money for those new students. For decades, it was assumed that families would move out to the edge of the suburbs for the biggest, cheapest house they can find. That drove much of Montgomery County’s growth during the 20th century, and the school system responded. Between 1940 and 1970, the county’s population grew by six times due to the Baby Boom. As a result, MCPS built tons of schools in then-new suburban communities like Silver Spring, Wheaton, and Bethesda to accommodate the growth in students. 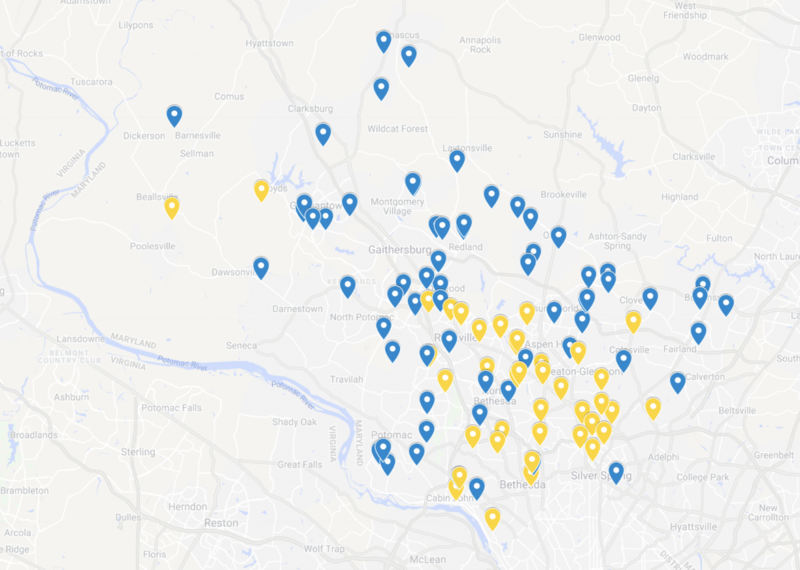 During the 20th century, Montgomery County closed several schools (yellow) in close-in areas, while buying land (blue) to build new schools in farther-out areas. Image by the author. But in the 1970s and 1980s, those areas were built out and aging, the student population slumped, and young families were moving to even newer suburbs in places like Gaithersburg and Germantown. So MCPS built lots of schools out there, and purchased land to build even more, while closing many schools in older communities. (Here's a map of all of the county's closed schools and unbuilt school sites.) Some of those schools were open for just 10 or 15 years. As recently as 1980, the county planned to close Montgomery Blair High School in Silver Spring due to declining enrollment. Today, the pattern is reversing, as the downtowns of Bethesda, Silver Spring, and Wheaton have become major shopping and job centers, and people seek out urban living. Outside of Clarksburg, most of Montgomery County's population growth is happening in the same communities that were losing residents 30 years ago. In 1998, Blair moved to a new building because of growing enrollment; now, it's the county's largest high school. And MCPS has reopened a number of formerly-closed schools, like Newport Mill and Loiederman middle schools in Wheaton. Meanwhile, schools in further out areas have hundreds of empty seats, like Springbrook High School in White Oak, or Seneca Valley High School in Germantown, which has 1,200 students in a brand-new building built for 2,400. The implicit assumption behind school capacity tests is that new homes, or new people, can just go to areas where the schools have room. Those areas are losing students for the same reason that those closer to activity centers are gaining them: White Oak and Germantown are far from jobs and amenities, and that’s discouraging people from moving there. This summer, Montgomery County placed a moratorium on the Blair High School and Northwood High School catchment areas, which covers much of Silver Spring, Takoma Park, and Wheaton, as well as Ashburton Elementary School, which serves part of Bethesda near Montgomery Mall. It’ll last a year. As a result, hundreds of new homes have been put on hold, including 715-719 Sligo Avenue, a planned building with 70 subsidized, family-sized two- and three-bedroom apartments in downtown Silver Spring. What happens to the people who might have gotten to live in those homes? MCPS planners told Katie Shaver: many of them might still live here, but in less-than-ideal conditions. And some of them may choose to leave the county entirely, and not get any of the benefits of Montgomery County’s well-regarded schools. Montgomery County Public Schools is the largest school system in Maryland, and growing by 2,500 students each year. The ultimate question is: how do we make room for them? The former Blair High School, now an elementary and middle school. Image by the author. We could stand to redraw some boundaries to take advantage of the empty space we do have. We also need to build schools in the close-in neighborhoods where they're most needed, though it can be challenging due to limited space. As with homes, neighbors will fight new school construction too. In Forest Glen, some residents fought the building of Flora Singer Elementary School, home to an elementary school that was demolished decades earlier, because trees would be cut down. In Kensington, neighbors (and County Executive candidate Marc Elrich) tried unsuccessfully to block the new Silver Creek Middle School, saying the site was too small. Another solution may be to repurpose other buildings as schools. This fall, Alexandria opened a new elementary school in a converted office building, and Fairfax County did the same a few years ago. Montgomery County has tons of underused office space, which conveniently happens to be near some of its most overcrowded schools. Schools are an important piece of infrastructure. So are homes. This summer, Planning Board chair Casey Anderson noted that many people talk about schools or roads or power lines as infrastructure, but forget that housing is a form of infrastructure too. Just as we need to build more schools for a growing student body, we need to build more homes for a growing population. After all, people need places to live, and when they have stable, affordable places to live, they can fully participate in life. They can comfortably raise families or start businesses or get involved in their communities. But our county has been falling behind in its housing infrastructure needs for years, which has pushed prices up and pushed people out. Instead of trying (and failing) to keep new students out by blocking housing, we need to build more classrooms.